"We claim that we are the rightful owners of our tribal territory, and everything pertaining thereto. We have always lived in our Country; at no time have we ever deserted it, or left it to others. We have retained it from the invasion of other tribes at the cost of our blood. Our ancestors were in possession of our Country centuries before the whites came. It is the same as yesterday when the latter came, and like the day before when the first fur trader came." "We are aware the BC government claims our Country, like all other Indian territories in BC; but we deny their right to it. We never gave it nor sold it to them. They certainly never got the title to the Country from us, neither by agreement nor conquest, and none other than us could have any right to give them title. In early days we considered white chiefs like a superior race that never lied nor stole, and always acted wisely and honorably ... " Click to continue the 1911 Declaration of the Lillooet Tribe (St'át'imc Chiefs Council). Indian Rights Association Delegation, Ottawa, May 1916. 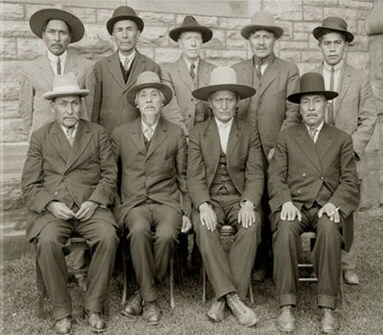 In 1916, BC members of the newly formed Indian Rights Association travelled to Ottawa to express their grievances over land rights to the Canadian government (left). Included in the Delegation were three St'át'imc (pronounced "stat lee um") leaders: Xaxl'ip Chief Thomas Adolf (who also signed the 1911 Declaration of the Lillooet Tribe); T'it'q'et Chief James Raitasket; Lil'wat Chief William Pascal (who travelled to Ottawa again in 1927). 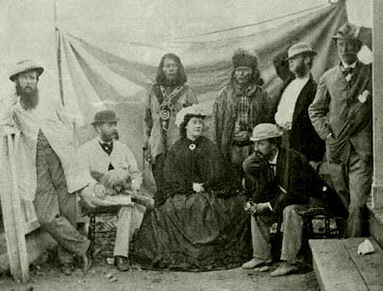 Standing (from left): Kamloops Chief Elie Larue (Secwepemc); Thompson Chief John Tetlenitsa (Nlaka'pamux); James Teit (Spences Bridge resident, ethnologist and white supporter of Aboriginal Rights); Xaxl'ip Chief Thomas Adolph (St'át'imc); and Lil'wat Chief William Pascal (St'át'imc). Seated (from left): T'it'q'et Chief James Raitasket (St'át'imc); Douglas Lake Chief John Chelahitsa (Nlaka'pamux); Tobacco Plains Chief Paul David (Kootenay); and Bonaparte Chief Basil David (Secwepemc). "Our vision is of a continuing and renewed relationship between St'át'imc people (ucwalmicw) and the land (tmicw) which: respects St'át'imc cultural traditions - using the ways (nt'ákmen), laws (nxékmen) and standards of our people as passed down through the generations; respects nature - putting the health of the water, the air, the plants, the animals and the land itself before all else; is under St'át'imc authority - letting our people decide collectively how the land and resources of the St'át'imc territory will be managed; and serves the St'át'imc communities - recognizing that resources continue to provide sustenance in old and new ways to all our people" St'át'imc Chiefs Council. 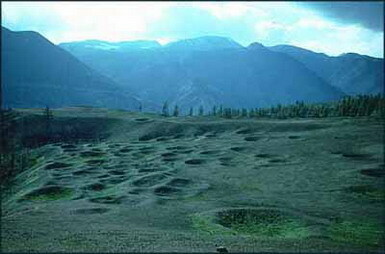 Historic St'át'imc house pits, Keeley Creek, near Lillooet. Sources: USLCES (Upper St'át'imc Language, Culture and Education Society); St'át'imc Historical Timeline (Trefor Smith, Our Stories are Written on the Land: a Brief History of the St'át'imc 1800 - 1940); T'ít'q'et Community (P'egp'íg'7lha Traditional Government); Lillooet Language (Yinka Déné Language Institute); James Teit, The Lillooet Indians (1906); Glimpses into Upper St'át'imc History (USLCES); Joanne Drake Terry, The Same As Yesterday: The Lillooet Chronicle and the Theft of Their Lands and Resources (1989); Brian Hayden, ed. 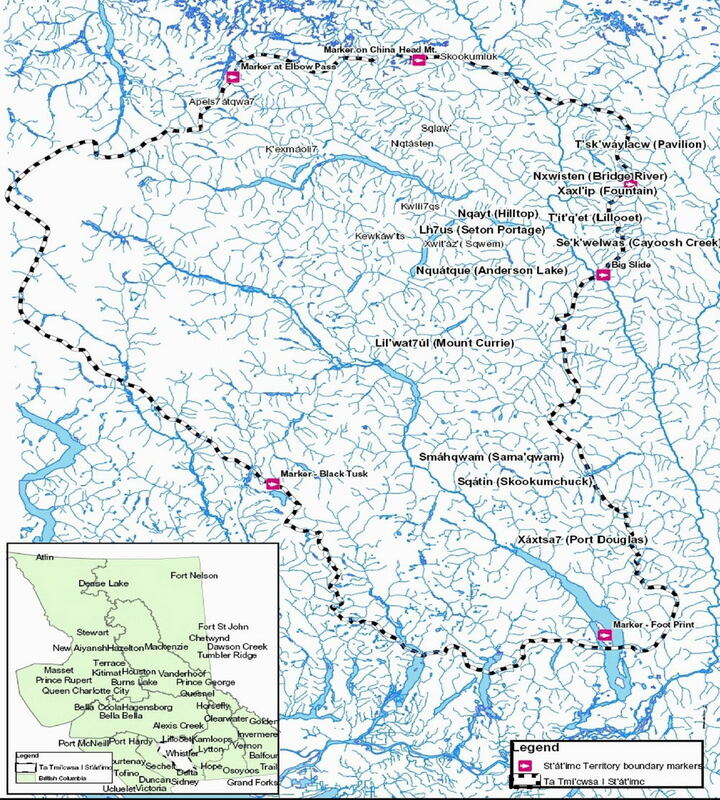 A Complex Culture of the BC Plateau: Traditional Stl'átl'imx Resource Use (1992); Keatley Creek Site (Simon Fraser University); St'át'imc Territory (District of Lillooet). Not many St'át'imc grave figures carved from red cedar survived the pillaging of Indian burial grounds carried out by miners and settlers and few can be seen today in museums. St'át'imc graves such as those in a c. 1870 photo (right) were described by the Jesuit missionaries: "Among the Lower Lillooet the body was sometimes placed sitting upon the ground covered with a heap of stones, or deposited in a grave box, in front of which were set up wooden figures representing the deceased, and dressed in his clothes" Lillooet Indians (Catholic Encyclopedia, 1910). The St'át'imc Chiefs Council consists of political representatives from the eleven St'át'imc Nation communities: Ts'kw'aylaxw (Pavillion); Xwisten (Bridge River); Xaxl'ip (Fountain); Tsal'álh (Seton Lake); T'it'q'et (Lillooet); Sek'wel'wa'sa (Cayoosh Creek); N'quatqua (Anderson Lake); Lil'wat (Mount Currie); Smáqwam (Sama'qwam); Sqátin (Skookumchuck); Xáxtsa7 (Port Douglas). 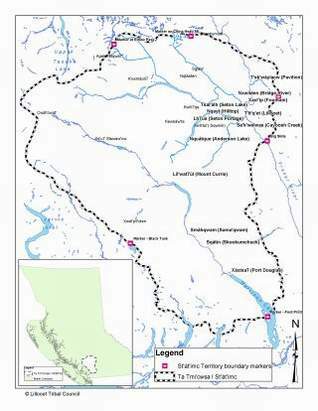 The St'át'imc Chiefs Council does not recognise the authorities of the provincial or federal governments to unilaterally designate land in St'at'imc Territory and is not taking part in the British Columbia treaty process. "Grave of an Interior Indian Chief," c. 1870. 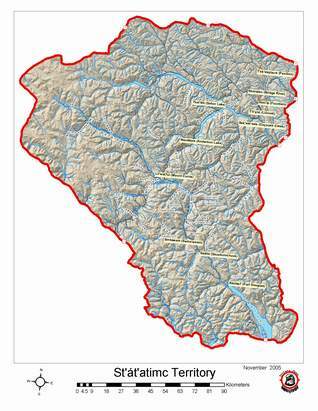 The St'át'imc Land and Resource Authority has mapped the northern part of St'át'imc Territory. 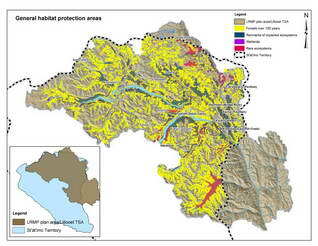 For example, see the map: General Habitat Protection Areas. The St'át'imc Land Use Plan Nxekmenlhkalha lti tmicwa upholds the ecological principles of the Convention on Biological Diversity. In stark contrast, the BC government supports an extinction program for much of the region's remaining wild lands and wildlife by giving free reign to resource and development companies in its pro exploitation and unsustainable Land and Resource Management Plan. One example is the excessively high timber cut rate that has been approved for another six decades. Another is the government's blatant promotion of destructive industrial tourism (ie. Lillooet Resort Opportunity Study) which disregards international edicts such as the UN's "Rights of Indigenous Peoples" or "The Berlin Declaration" on sustainable tourism and biological diversity. "Lillooet Indians," 1865. Commemorates the colonial governor's visit to St'át'imc Territory. St'át'imc Chiefs and colonists, Lillooet, 1865. Xaxl'ip Chief Tsil.husalst (d. 1883) met the colonial governor in Lillooet in 1865 (above). One portrait of the Chief (right) exists. 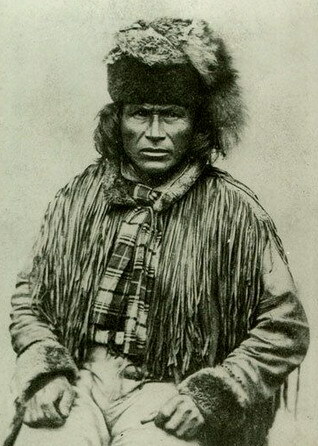 Xaxl'ip Chief Ernest Jacob (d. 1985) recounted the "one third" agreement made with Queen Victoria following the victory of the Indians in the Fraser Canyon War of 1859: each party was to evenly share one third of the revenue collected from the natural resources on Indian land. The "one third" agreement was never kept by Britain or Canada. "Indian Chief of Fountain Band"
"Lilloett (sic) on the Fraser River," 1864. Lillooet is one of the oldest inhabited locations on the continent and an important centre of St'át'imc culture. In 1860, the Royal Engineers were sent to Lillooet to secure passage for the prospectors and it soon became a boom town (above). Lillooet then went "bust" until 1884, when the nearby Cayoosh Creek became the site of the single richest find in BC gold mining history: Cayoosh Gold Rush. 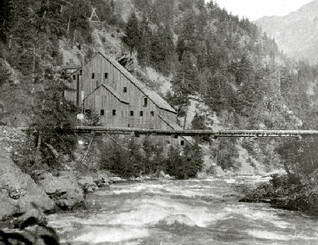 Later industrial mining ventures included the Cayoosh Creek Cyanide Mill (right) and Bralorne Pioneer Gold Mine, once the richest in Canada (it operated from 1887 to 1971 and at present is gearing up to reopen). Cyanide is used to extract gold from ore and contamination from mining wastes continues to poison St'át'imc waters and salmon habitat. Development has been a catastrophe for the St'át'imc. For 150 years they have seen their land and waters degraded, their resources plundered and their way of life annihilated. The European invasion began with the Fraser Canyon Gold Rush in 1858. 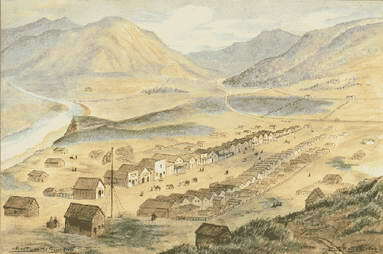 The first colonial governor penetrated the heart of St'át'imc Territory by building the Douglas Road to transport miners from San Francisco to the Fraser Canyon. With the white invaders came numerous diseases to which the St'át'imc had no immunity. Worst was the small pox epidemic of 1862 which decimated the St'át'imc population, killing off entire villages and families. "Cayoosh Creek Cyanide Mill," c. 1910. When BC joined the Dominion of Canada in 1871, its total population was fewer than 40,000, of which almost 30,000 were indigenous. In the decades that followed, indigenous people were displaced and marginalized by massive waves of settlers. One of Lillooet's early settlers was Caspar Phair, also the first government agent and gold commissioner. 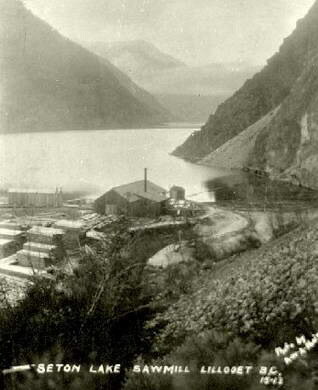 A photo by Phair (right) shows a sawmill at the head of Seton Lake in 1910. None of the many mines and sawmills in St'at'imc Territory have ever been St'át'imc owned, thus the huge profits made from resource extraction were not shared. Nor did the St'át'imc benefit from the engineering tour de force Bridge River Power Project, BC's largest development project (below) when it began in 1927. "Seton Lake Sawmill, Lillooet BC," 1910. "Nxwisten" is the St'át'imc name for Bridge River and also the name of the people who live its confluence with the Fraser River. Their village is situated at what was once an important fishery called Sxetl (Bridge River Fishing Grounds). 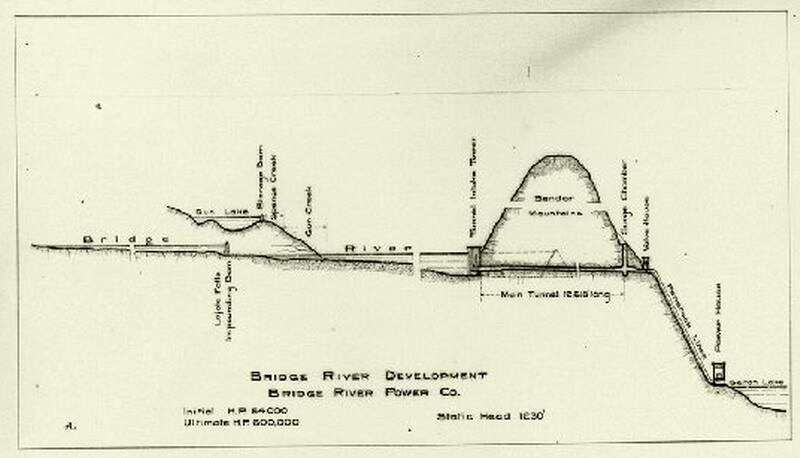 The Bridge River Power Project consisted of three dams and four generating stations. In 1960 Bridge River was dammed and its water was diverted to Seton Lake (right), causing incalculable environmental damage and hardship on the St'át'imc who depended on the Bridge River salmon for sustenance. 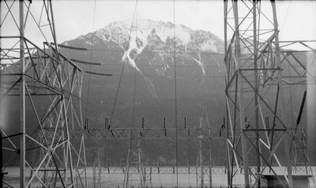 Much of Vancouver's electricity comes from this BC Hydro site, yet the St'át'imc have never been properly compensated for the loss of their land and fishing grounds or for the ecological degradation that continues to this day. BC Hydro station, Seton Lake. Freight train on Seton Lake transporting raw resources through St'át'imc Territory to Vancouver. Seton Lake from Mission Mt, 27 April 2006. The St'át'imc name for Seton Lake (left), is Tsal'álh (meaning "the lake"). Tsal'álh is also the name of a St'át'imc village on the northern shore of the lake. Historically there were several villages located here, but under the Indian Act they were forcibly amalgamated. 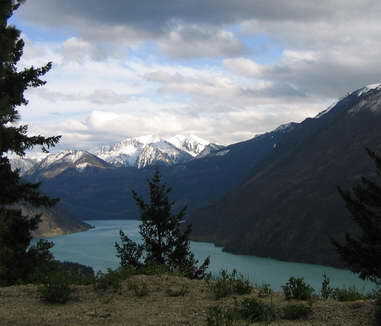 Seton Lake had already been despoiled by mining and logging activities when the government blocked its eastern end in 1903, causing more depredation and diminishing the number of salmon available to the Tsal'álh, causing great hardship. In 1913, the Pacific Great Eastern Railway was built through St'át'imc Territory (above), destroying pit houses, villages, burial sites and hunting grounds. To accomodate the railway and to open the area up for settlement, the government expropriated the best located and most fertile reserve land. Today the St'át'imc communities located on Seton Lake are called Shalalth and Seton Portage. 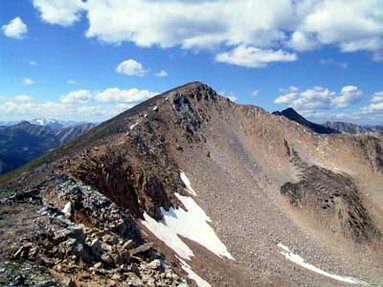 Gott Peak, Lilloeet Range, height: 2511 m.
Gott Peak in the Lilloeet Range (above) is named for the remarkable Lillooet (T'it'q'et) man known as Francis (Frank) Gott (c. 1850 - 1932), a celebrated big game hunting guide with a legendary knowledge of St'át'imc Territory (below). 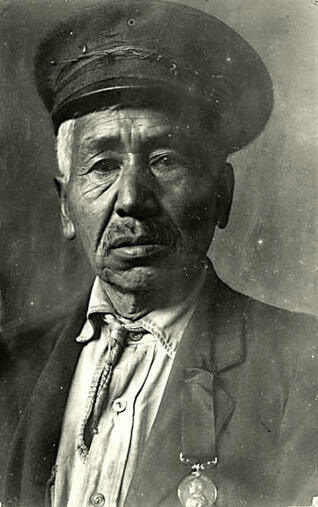 T'it'q'et Francis Gott with grizzly, n.d.
T'it'q'et Francis Gott, c. 1915. Frank Gott was in his sixties when WWI began but he enlisted in the Expeditionary Forces in defiance of age regulations and served as a sniper, winning a medallion for his heroism (above). 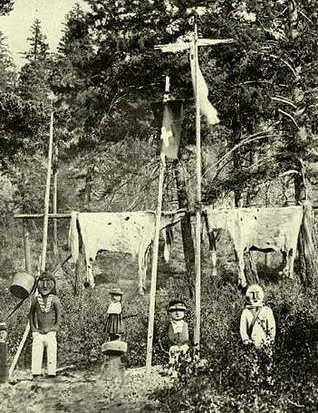 The BC Game Act was imposed by the colonial officials in 1898 to enforce elite British hunting rules on the indigenous people and prevent them from hunting for food. 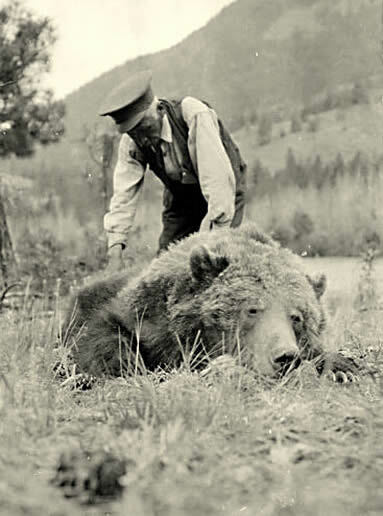 Game wardens and their strict hunting regulations were justifiably despised by the natives for whom hunting was a vital part of their sustenance and cultures long before colonization. 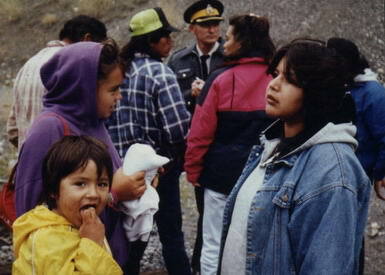 Frank Gott was repeatedly harassed and penalized by the Lillooet game warden. We don't know the circumstances as to why Gott shot and killed the warden when he tried to fine the Lillooet war hero for having an undeclared deer carcass at his hunting camp. Knowing that he would be found guilty by the BC court system, the 76 year old Gott disappeared into a rugged valley later named after him (Gott Creek), about 25 km from Lillooet. When he was finally apprehended, Gott resisted arrest and was shot and killed.